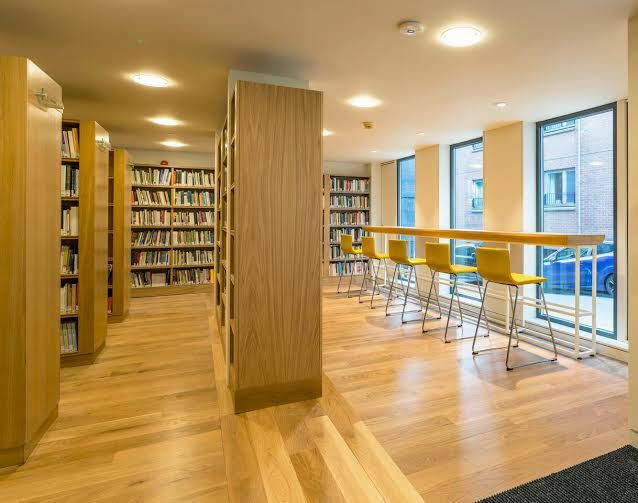 1 Dec – The £380k redevelopment of Edinburgh’s Scottish Poetry Library Building, designed by Nicoll Russell Studios and built by fit-out contractor Morris & Spottiswood, has been completed. In addition to the new extension and terrace area, it also now has a new soundproof space to allow poetry to be recorded, as well as “improved” reading and education facilities and a retail area. 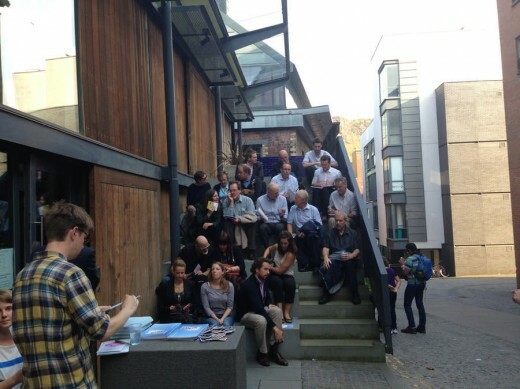 The extension proved controversial, with the usual hostility that characterises much architectural debate in Edinburgh. 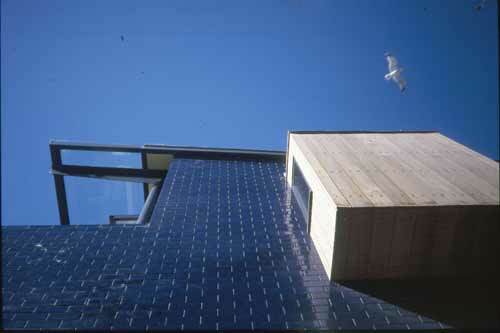 The architect of the original building, Malcolm Fraser, objected, as did Alan Dunlop and myself. But that is in the past, we’ll visit the building shortly to assess it. “Our building was designed for what we were doing in the 1990s, and we need to plan for the 2020s, and even for what we can’t imagine doing yet. 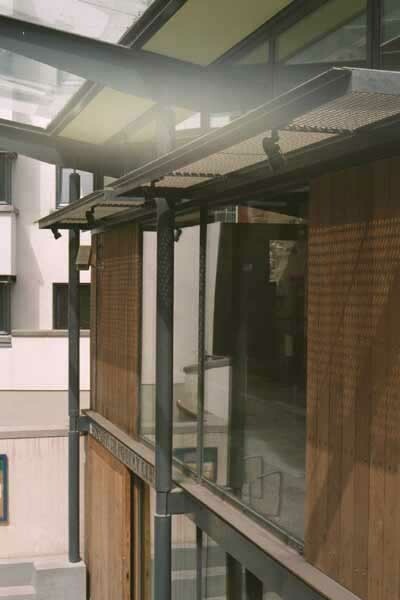 The original building had unused space for development, and several bespoke elements: an obsolete garage as there was no longer a call for a travelling library; an unused upper terrace, which had become unsafe; and a forestair meant to be used as an external reading and listening space, but rarely used for this purpose…. • A welcoming entrance and increased visibility of the life of the library. Active public realm, isn’t this what we want for our cities? I object to these proposals.
. 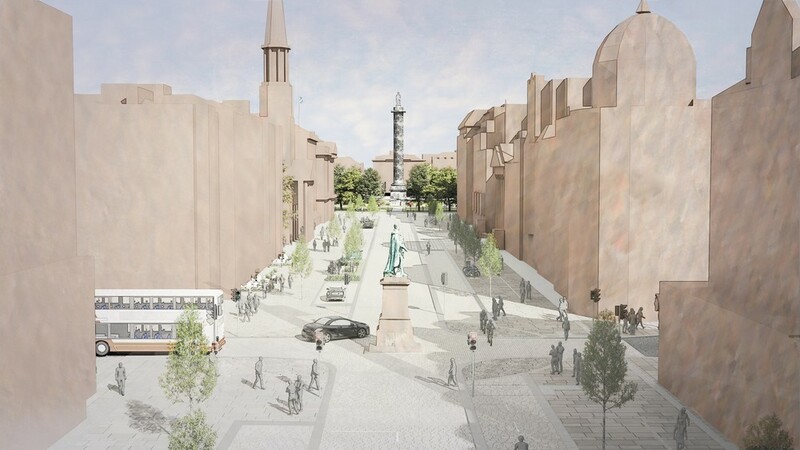 The Privatisation of the Old Town’s Urban Realm: the Courtyard and Reading Area was reserved, under the Holyrood North Site Masterplan, as part of the public realm. The proposals, essentially, privatise this area.
. 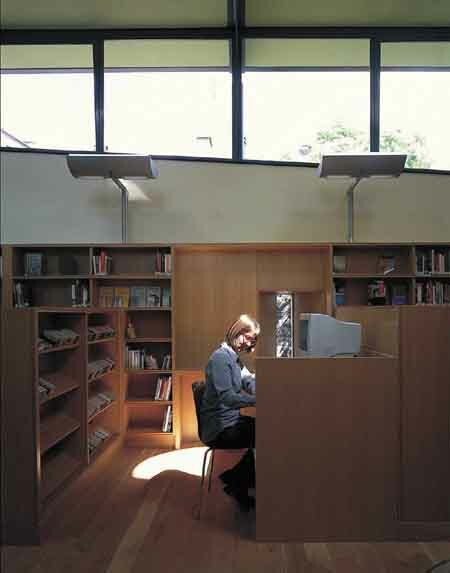 The Loss of Original Features: the destruction of the Forestair and Courtyard Reading Area.
. 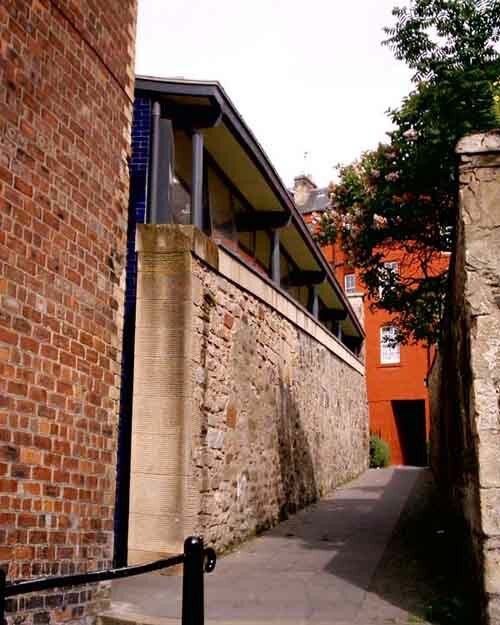 Severe Damage to the Original, Complete Design: the building was conceived as a contemporary re-interpretation of the mediaeval buildings of the Old Town, which met their sloping sites with vigour and imagination. The Reading Area and Forestair do exactly that, settling-in to the steep Close elegantly. The proposal’s perspective, from up the Close, seriously misrepresents this slope, flattening it out by up to 20 brick courses (well over one metre); but still demonstrates the extreme awkwardness of the proposal’s relationship with its steep site.
. The Loss of a Work of Art: Mary Bourne’s “Carpet of Leaves” sits at the door and is a place-specific work, mediating between the landscape (the distant view of the crags) and the building. The proposal assumes its removal or, at least, it being stripped of meaning.
. That the Library’s Brief can be Entirely Met Within the Existing Building: as the proposals I have drawn for them have demonstrated. 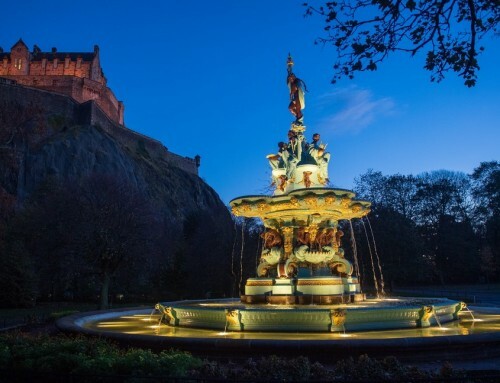 In Conclusion: this proposal severely, and unnecessarily, damages a much-loved and highly-regarded work of architecture, that is of integral significance to the World Heritage Site. 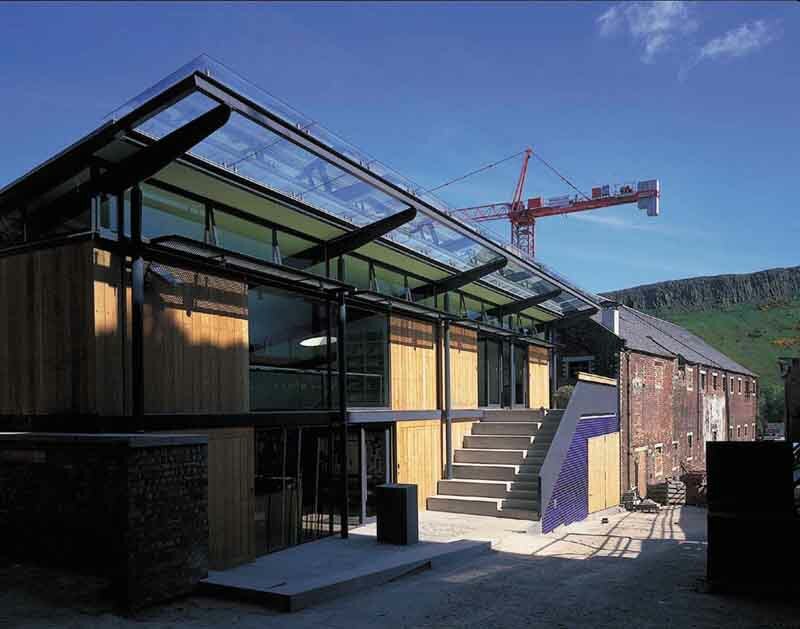 The fall out follows a dispute between the architect and the library’s board over how best to accommodate the institutions needs going forward, which led to the architect parting ways with the library – to be replaced by Nicoll Russell Studios when the brief was put out to tender. What a curious idea, first the Scottish Parliament now the Scottish Poetry Library, how can our leaders be so bereft of vision! This is one of my favourite buildings in the city, moving back to Scotland, to Leith in 1999 from London, this and the Fruitmarket Gallery were what made the biggest impression on me. Many hundreds, probably thousands of people on our architecture walking tours have found joy in the public realm and frontage, as a balanced piece of design it is a successful gesamtkunstwerk that sits so well in the Old Town. 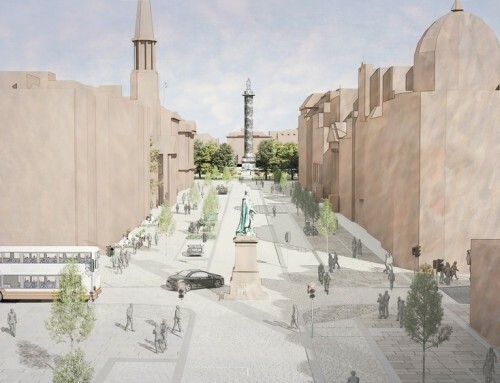 It works harmoniously with the North Holyrood Masterplan which is without doubt the best masterplan Edinburgh has seen in the last one hundred years. Why? 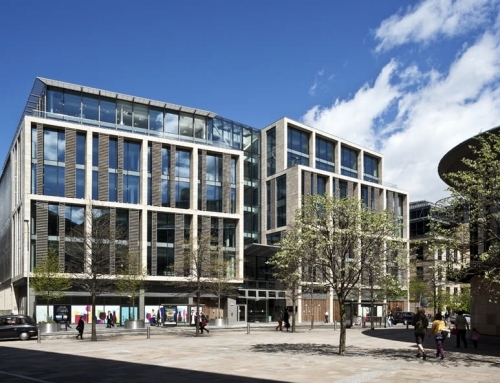 as explained in great detail in other posts on this website by me – and respected architects such as James Simpson – the plan worked with the context of the Old Town, it understood it, yet it brought in fresh new architecture, such a challenge in our slightly-over-protective World Heritage Site. Malcolm Fraser really understands the Old Town too and his building clearly shows this. Any renewal needs to work much more sensitively with what is there. Just because it isn’t medieval doesn’t mean we shouldn’t take good care of it, we build our society by protecting the best of what has been produced! 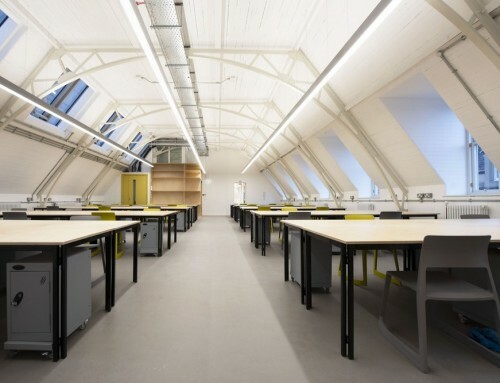 The design is by Nicoll Russell Studios who are a good, well-respected architecture practice based in Dundee. Perhaps the CGI doesn’t do justice to their proposal? Nevertheless the concept just isn’t right, no doubt the Client has pushed in the wrong direction. Indeed, it is only natural for any building owner to wish to expand but this building is a finished piece of architecture on a tight site, it is really simple, expansion can only happen by moving site. 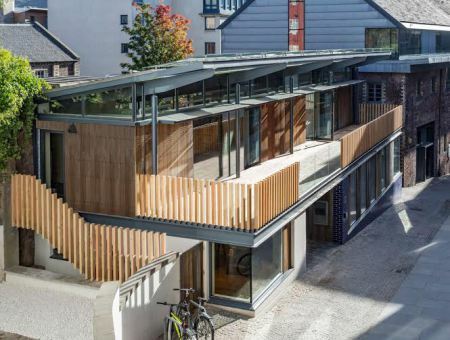 I write to object to the proposed additions to the Scottish Poetry Library and in absolute support of the original design intent and the work of the architect Malcolm Fraser. 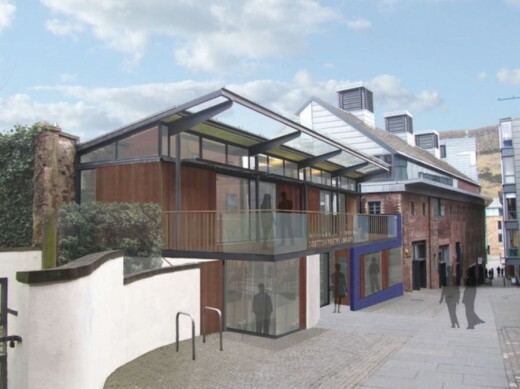 The proposed additions appear, at best, workmanlike and the attitude and aspirations of the client do not fully appreciate, in my view, the unique contribution the Poetry Library has made to raising of quality of new architecture in the old town and in Scotland. 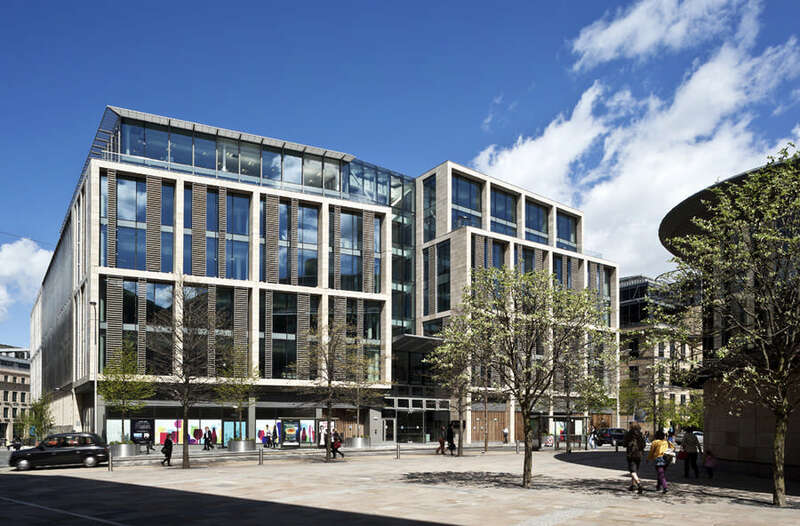 This little gem of a building also made it possible for people who were perhaps wary of contemporary architecture to see that a modern building could be sensitively introduced into an historic fabric without resorting to pastiche. As such the original design must be protected and the intent of the original architect supported. I would respectfully ask therefor that you reject this proposal. 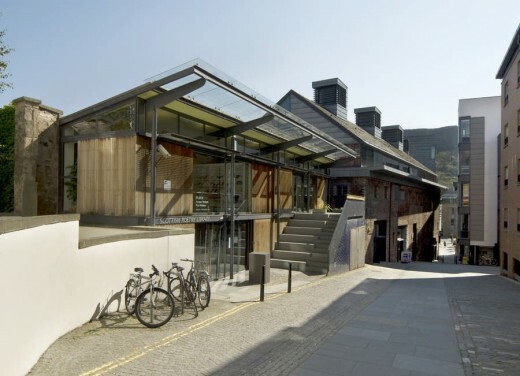 A grant from the Scottish Arts Council National Lottery Fund was the main finance for The Scottish Poetry Library building. 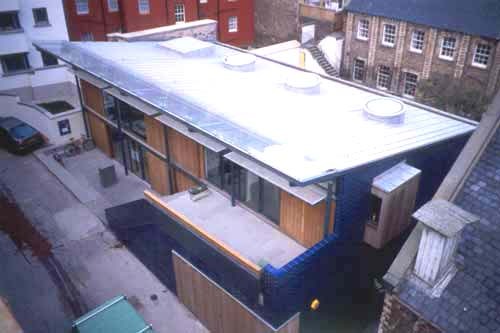 Sensitive steel-framed addition to another close off the Royal Mile using oak cladding and blue glazed terracotta tiles. 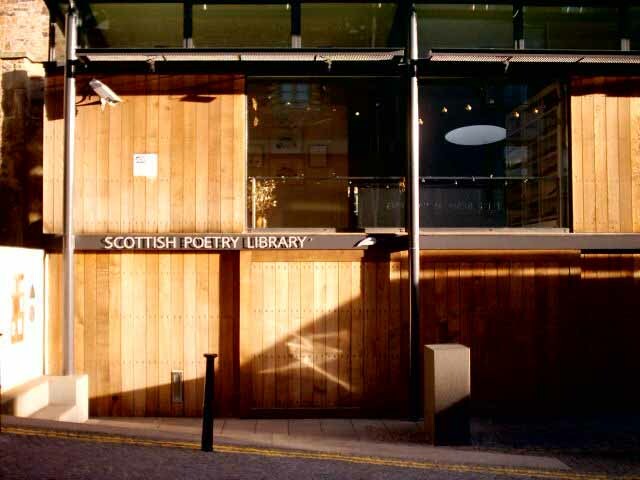 The Scottish Poetry Library presents a highly articulate façade to the person emerging from the close’s narrow entry: the majority of users will only see this façade and it is weighted accordingly. 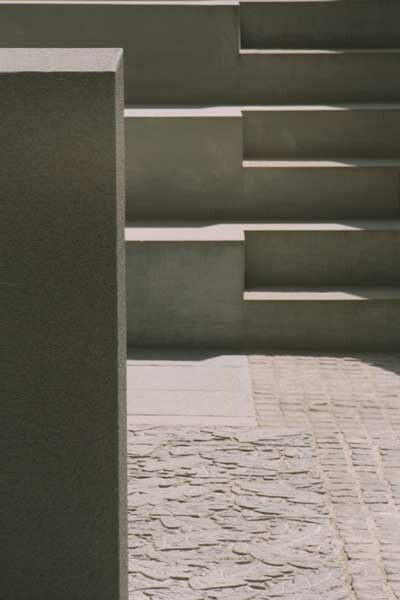 Entry to the Library is in the centre between the clean lines of a stone lectern and its pleinair‘audience’ the concrete steps – double-height for seating, single for access. This mini-Greek theatre should enjoy greater use when the dust and noise from the adjacent construction site abate. 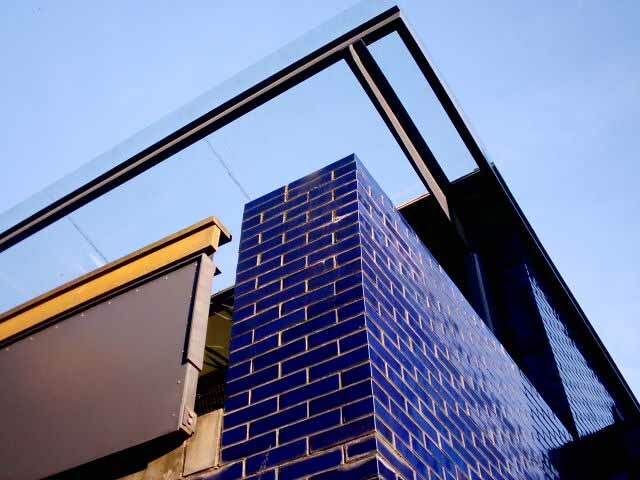 The steps and terrace to which they lead are protected by delightfully-detailed lead balustrade and the mass is clad in blue glazed terracotta tiles. 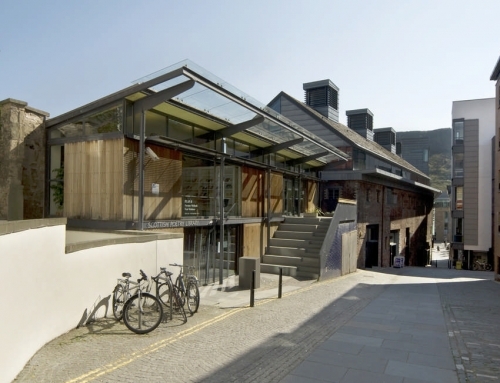 These contrast well with the Scottish Poetry Library’s warm oak vertical-board cladding whose bolt fixings help create the façade’s rhythm. 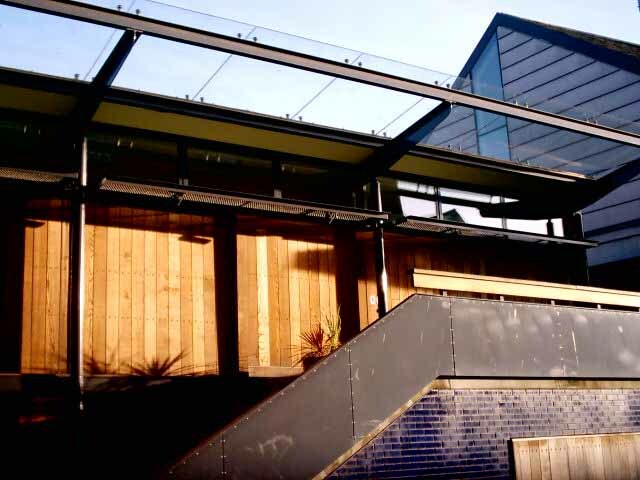 Above the boarding lies a continuous mesh canopy; above this a glass clerestorey joins the oversailing roof with a glimpse of the lime green ceiling that continues inside. 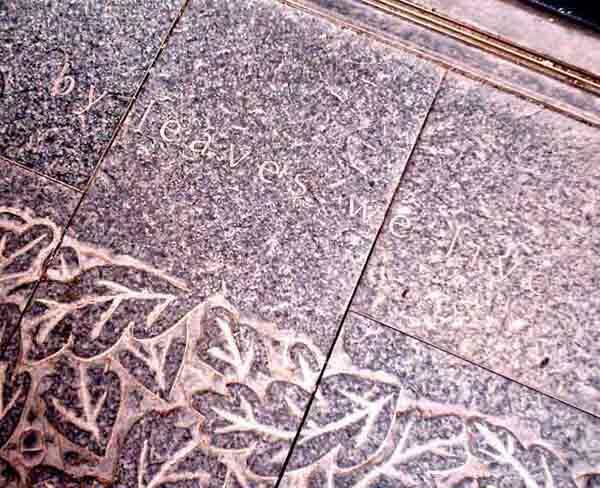 Note the inscription underfoot at the Scottish Poetry Library entry – ‘By leaves we live’ – by Edinburgh notable, Sir Patrick Geddes and the connected leaf-patterned stone relief. Inside you are drawn past reception and under the mezzanine which covers half the floor, towards the light. 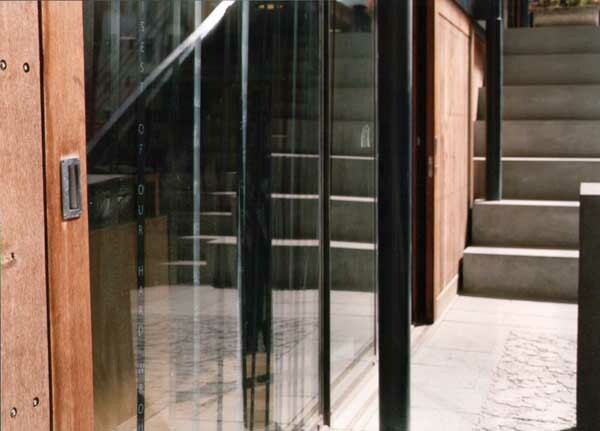 The double-height space is partially separated from the mezzanine with stair and lift creating just enough privacy. 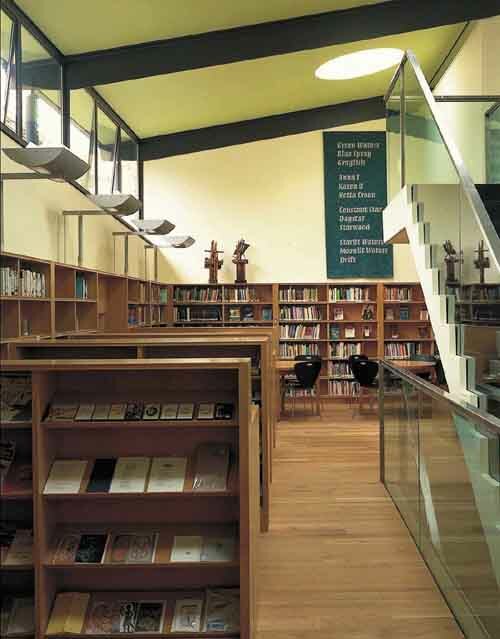 Oak is used throughout the Scottish Poetry Library, notably on the ground-floor boarding with black vinyl for the stairs and mezzanine floor, stainless steel for the balustrading and tern-coated stainlees steel for the roof. 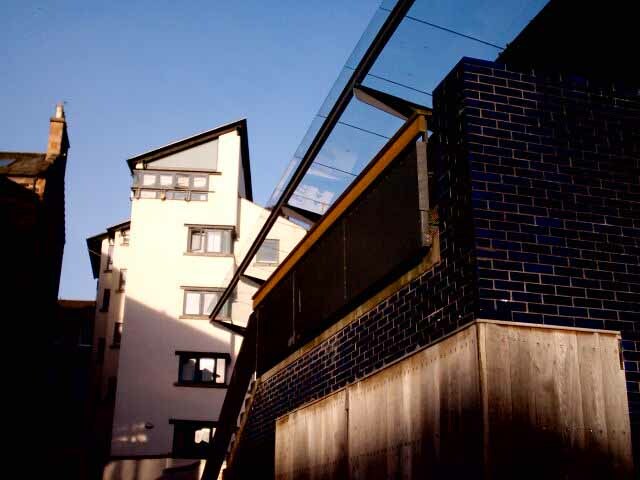 In summary the Scottish Poetry Library is a jewel of a building which sits vividly in the mind (everyone remembers the blue tiles), best seen from outside where it is cleverly articulated. Building Design 4 Jun 1999: supplement available in Library. 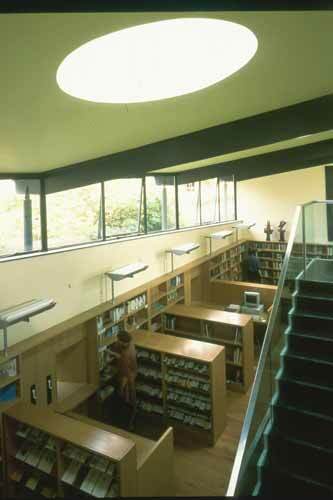 The Library was shortlisted for Channel 4’s Building of the Year 2000.